White water rafting is one of the most exciting ways to get from A to B, and when you take on a trip on the white water, then you are really looking to enjoy the journey rather than looking to get to the destination as quickly as possible. The real excitement for most people is the opportunity to get wet as they go bouncing and paddling through the rapids, and the drops and turns in the river really help to make the trip successful. However, most such trips won't just be about the rapids, as the calmer periods on the river help you to relax and to enjoy the spectacular surroundings that these rivers are flowing through, with some of the country's best scenery on display. Flowing from the stunning mountain scenery of the Yosemite National Park, this rafting adventure is one of the most popular trips in the country, and the action can be enjoyed over one, two or three days. This is located in a very rural and remote part of the state, so there aren't too many towns in the area, although Sonora and Groveland are usually the bases used by most people coming to explore the river. Grade IV and V rapids offer some great thrills during the journey, with the Tuolumne providing a cool stretch of water running through this dry and hot part of the state. 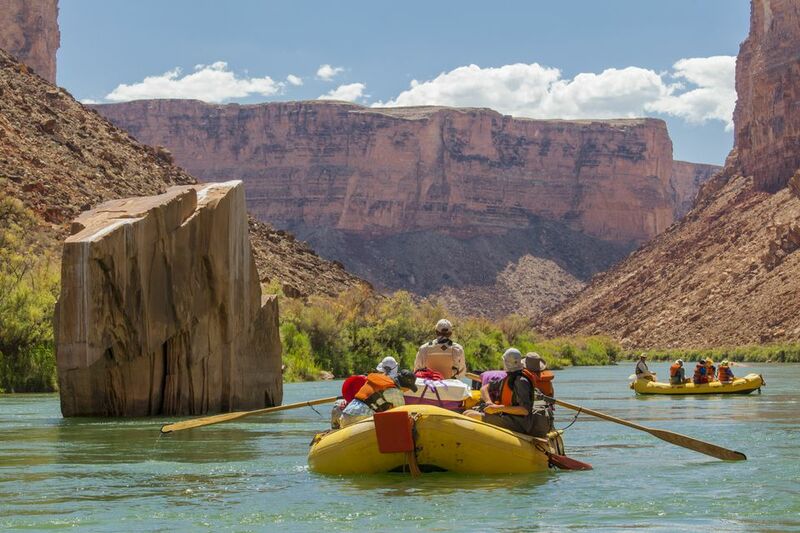 Taking visitors along the most famous stretch of river in the United States, rafting on this river offers a variety of different rafting challenges, with the epic scenery of the Grand Canyon making for a stunning backdrop to the action. Flagstaff is a great base from which to start your trip along this amazing river, and there are a variety of options from one day excursions to much longer adventures that can last up to two weeks, with other activities included along the way. Located in one of the most beautiful areas of the Rocky Mountains in Colorado, the Arkansas River offers some stunning surroundings in which to venture on to the water, with the river flanked by high peaks on all sides. The rapids go all the way up to Grade V, with an awful lot of fun to be had down the deep Royal Gorge, which is a stunning steep sided gorge filled with white water. Most of the white water rafting will happen on the Lower Deschutes, which is a hundred miles of river running from the town of Deschutes down to the Pelton Dam. The river flows through a beautiful deep gorge with some superb rapids that is almost untouched by human activity, and is known for the wonderful biodiversity, with animals such as deer, bighorn sheep and ospreys commonly seen along the route of the trip. Situated in one of the most remote parts of the country, this wonderful river flows through unspoiled countryside with deep valleys and beautiful forests, and offers a great variety of different rafting trips. The majority of visitors head to the largest rapids that are found in the Middle Fork section of the river, but those looking for a longer trip can enjoy a wonderful week of rafting along this stunning river. The stunning Grade V rapids that can be found along the Section IV stretch of the river are enough to challenge the hardiest of rafters when the waters are high, while the rapids and the river level drops in the summer to offer more family-friendly rafting. Passing some beautiful valleys and flowing through some nice gorges, this is a great destination for rafting in the south east.